While flying from Seattle to San Francisco, we approached over the west side of the city, giving me a great view on this almost cloudless day. Golden Gate Bridge with the Marin Headlands to the left and the Presidio to the right. Downtown with Treasure Island, the Bay Bridge, and Alameda on the top side of the picture. This entry was posted in Uncategorized and tagged sanfrancisco by christao408. Bookmark the permalink. You should also mention that the boat looking thing is actually Alcatraz! from the bay here, first time seeing the city in this angle. 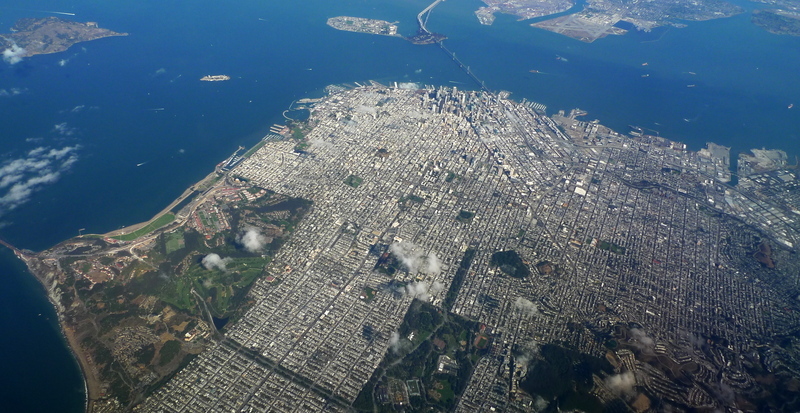 I am always amazed when flying into San Fran and even LA – the approach over the water and the city is unreal. You got some nice shots with the clouds. Beautiful views. A cloudless, clear day such as this is rare for this sort of photography. Thanks for sharing. Amazing shots and was this taken with your Iphone. @Grannys_Place – Oh, that wasn’t with the iPhone. I used my Lumix LX-5 for those shots. @Fatcat723 – Overwater approaches are especially interesting. @slmret – @timestill – @npr32486 – @oxyGENE_08 – @jandsschultz – @grannykaren – Turned out pretty nicely, no? @secade – Artificial island in the bay that has an interesting history. More about it here. @Wangium – All the more reason to fly more on sunny days.